CHOOSE THE PERFECT BAND FOR YOUR SPECIAL OCCASION! Function Junction can provide a wide range of acts to cover many different musical genres. Our most popular type of act is a four or five-piece pop/rock band playing a selection of hits from rock n’ roll, through the decades of the 60s, 70s, 80s, 90, 00s, right up to today’s chart toppers. Different acts may concentrate more on certain eras and styles of music, but all will usually cover a core of material from the most famous and influential artists of the period, from Elvis, The Beatles and The Rolling Stones, onwards. Outside this core, some will concentrate on rockier material, whilst others more on the soul/funk side of the charts. 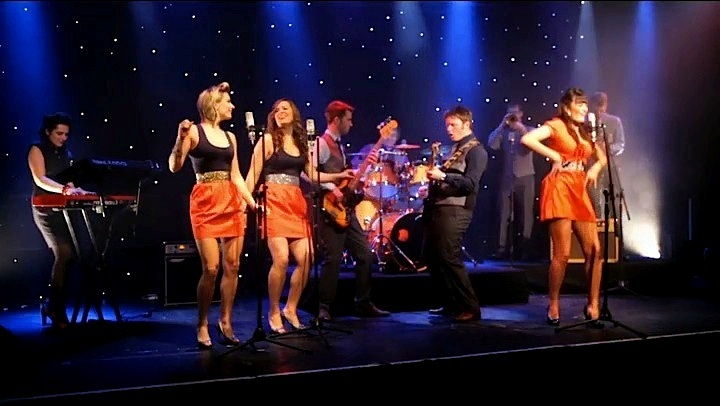 Some of our clients want to book pop bands which can also include some swing or jazz in the mix, either as part of a “cocktail” set or for dancing. These bands are likely to include a keyboard and also a saxophone or other brass. Choosing from among the excellent selection of bands on our website can be difficult, so when looking for a pop band we suggest that you think about what factors are most important to you. These might include whether you prefer male or female vocals, or want both; whether the size of the band is important – bear in mind that bigger bands tend to be more expensive; whether there are some particular songs or artists that you want covered. A popular alternative to a pop band is a ceilidh or barn dance band. With a caller explaining the dance steps, this is a great way of breaking the ice and getting everyone of all ages on to the dance floor. Ceilidh bands also tend to be a bit cheaper than pop bands. Most ceilidh bands are also happy for you to play recorded music through their PA systems, so you might still be able to finish the evening with some pop, although bear in mind that their sound systems will be fairly modest and nothing like a full disco. Swing/jazz is another popular genre. This can work really well if you are looking for background music for a drinks reception or meal. Walking into an empty room can feel a bit dead, but having some live music playing is very welcoming and really lifts the atmosphere. “Trad” jazz bands can play acoustically so this is another option when you need music outside or to be mobile. Many jazz bands can also provide great music for dancing, especially “roaring 20s” Great Gatsby style bands or jump jive bands. There are also some bands who can combine playing swing and jazz with pop and rock. This is ideal if you want some more gentle swing - such as Rat Pack - to start with and then go on to pop. Like jazz, salsa bands, with their infectious Latin rhythms, offer another option for both background and dance music. As with ceilidh bands, it is also possible to combine these with dance demonstrators who can talk your guests through some Latin dance steps and encourage people on to the dance floor. Classical performers have been perennial favourites for wedding ceremonies and drinks receptions. String quartets, harpists, classical guitarists and wind or brass ensembles all offer tasteful acoustic music, with wide repertoires encompassing not only well-known classics but arrangements of light and popular music from Broadway and Hollywood. Other musical options on offer include steel bands, winter or summer, a great way to bring some Caribbean sunshine to any event. Like trad jazz bands, they also offer the facility to play outside. And don’t forget tribute acts. An Elvis or Abba tribute can also provide a great evening’s entertainment, and Elvis has even been known to provide a surprise appearance at a wedding ceremony to serenade the happy couple.